Plot: Lillian Hellman, a playwright takes on a mission to smuggle money into Nazi Germany to help fight against them. Her best friend Julia gets her involved in the anti-Nazi movement. Lillian who is of Jewish Decent takes on the hefty cause. Twilight Time has done it again with this amazing choice. One of the great films of all time. Sadly, this movie seems to never get the push and wonder it deserves. This is a wonderful, dramatic story that should be seen and expressed, talked about. Thankfully the company Twilight Time honored this movie with a spot on Blu-ray transfer, and is a high definition beauty. Julia is one of my favorite films. If you know me I am a huge world War 2 history buff, mainly dealing with the Nazi’s and their unspeakable horrors. One thing I collect is World War 2 movies and documentaries. 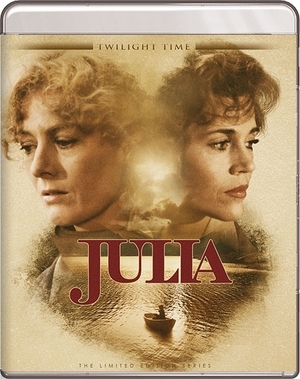 Julia is one of those films I was hoping to come to Blu-ray, and Twilight Time has answered that hope. Julia is a movie that is rich with acting, direction, and most of all storyline. It’s a film that stands out above and beyond a lot of films. The performances in this movie is jaw dropping brilliance at its finest. This stars one of my favorite all time actresses. She is on my top 10 Female actresses list. The beautiful, stunning and powerful Vanessa Redgrave. Redgrave is a god when it comes to capturing a character and giving that character life and the very essence of reality. She has starred in some of my favorite films, the one of kind masterpiece and World War 2 film, Playing for Time. Julia is worthy just to see her performance. The whole cast, Jason Robards, stunning. Jane Fonda gives one of the great filmed performances of cinema. The whole cast works. The director behind this wonderful film Fred Zinnemann needs no introduction, but because of this modern generation, who many persons calling themselves movie buffs, don’t look to the past of cinema, I have to describe a man that should be on any movie buff’s mind. Zinnemann was a director, producer that gave the world masterpieces. Yes, masterpieces. The one and only western masterpiece, 1952’s High Noon. If that doesn’t tell you anything nothing will. He also brought the masterpiece, 1953’s From Here to Eternity, 1948’s The Search, the amazing 1973's The Day of the Jackal, and the one I am reviewing 1977’s Julia, which I highly recommend watching just like all the others I have mentioned, and many, many others. Now his, From Here to Eternity, and also A Man for All Seasons (Which might I add Twilight Time has released on a Special Edition Blu-ray, which you can read my review for it HERE), both won him, Best Feature Film at the Academy Awards in 1953 and 1966. That shows you his amazing talent, and plus I have to mention that in his vast career of directing, he has directed 18 actors to be nominated for Best Actor by the Academy Awards, and 6 of those actors won for best actor in his films, which is a stunning realization of his brilliance in directing performers. Julia was nominated for 11 Academy Awards including Best Picture, Best Director, Best Actress, Best Supporting Actor, Best Supporting Actress, Best Adapted Screenplay. It won three of those awards. The beautiful stunning Vanessa Redgrave won for Best Supporting Actress. The movie also won Best Supporting Actor and Best Adapted Screenplay. I feel this movie deserved all the wins. It shocks me that this film has never been given the grand treatment it deserves, and so that is why Twilight Time did the amazing job of crafting this masterpiece on a new outlet. This film has never looked any better. The high definition is brilliant. The colors and picture quality is vibrant and the sound is crisp. Twilight Time does so many wonderful examples of how to treat a film. They bring worthy products, to absolutely praise. Isolated Score Track (with some effects). Composing the music for the film is another worthy to be talked about persona in the film world, Georges Delerue. He died young at the age of 67, but left a vast array of excellence to be remembered in the film world. He had an amazing total of well over 350 composing jobs. From such greats like, 1959’s Hiroshima Mon Amour, 1963’s Contempt, 1970’s The Conformist. The amazing 1983’s Silkwood, that I wish someone would honor and bring out on Blu-ray. 1986’s Platoon, 1989’s Steel Magnolias and many, many more from Composing, to musical director, to conductor. He was an amazing musician, and he shines on this isolated music track. Another fantastic special feature. Audio Commentary with Actress Jane Fonda and Film Historian Nick Redman. A wonderful listen. A great example of a special feature, Jane Fonda is always a great listen. Another fantastic commentary by Nick Redman. Redman is very knowledgeable and is always a true treat to listen to his expertise on film. This is a movie that stands the test of time. It’s a film that never gets old. I have seen it so many times. It was wonderful seeing it taken care of, and brought out on Blu-ray. Twilight Time truly knows how to treat an important film and give it a new outlet for future generations to enjoy. A wonderful film that I highly recommend. This is a must own Blu-ray. Beautiful transfer. A dynamic Blu-ray of dynamic film.